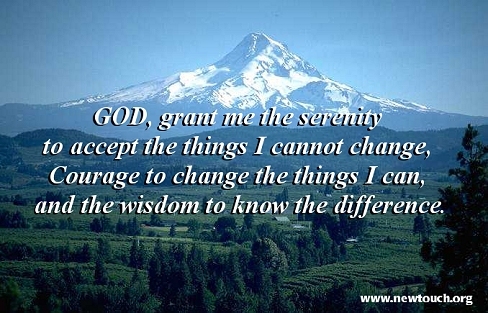 You may have already encountered this saying, the Serenity Prayer, perhaps on a tablemat in a souvenir shop or as the prayer associated with AA (Alcoholics Anonymous). You may have written it off either as a clichéd truism or as applicable only to alcoholics. If so, can I ask you to now reread the Serenity Prayer, now, slowly, as if you were reading it the first time? You may end up believing, like me, that far from offering trite advice it contains the seeds of great practical wisdom. Why do I say this? Let’s look at each of the three parts of the Prayer in turn. First, have the serenity to accept what you can’t change. Think about some things that you really, really can’t change. Perhaps the fact you weren’t born a millionaire, or that the world is not always a fair place. What is the best attitude you can take to these realities? To get angry? No, you’ll only make a bad situation worse. To try to put things right? By definition, no, because these are thing that you can’t change, so it will just be wasted energy. Accepting the situation and not letting it disturb your peace of mind is the only appropriate response. What about things that you can (and should) change? Although by definition these are things we can change, this doesn’t mean it’s easy, popular or risk-free to do so. It’s not easy to change oneself into being a more patient person (but it can be done). It is not always popular to campaign for something you believe in (but things can change as a result). We can change these things, but we need courage to do so. Luckily, before these thoughts got completely out of control, I remembered the Serenity Prayer. I had to accept with serenity what I could not change. Well, I could not change the fact that my wallet had been stolen. There was no point beating myself up or fretting about these unchangeables – that would cause me to be even more upset and also stop me thinking about what I could change. So, what could I change? Well, obviously I could limit my liability – first thing was to phone the bank. Then I could arrange for the credit card company to see if they could send me new cards before my travel – there was just sufficient time for them to do so. In future, I resolved, I would be more alert to people bumping into me. Using the Serenity Prayer helped me deal constructively with this mini-crisis, and it has helped me many times since. Forget the table mat image and AA associations and focus on the underlying message and it can be of great assistance to you too.